We compared eVoice to other business phone services to give an honest review. Phone services such as RingCentral are Voice Over IP systems, which means they are a digital service that can be used across many devices, including desk phones, desktop applications, and mobile devices, instead of a traditional phone service. Read on to find out if this service is the best option for your business phone needs. eVoice offers many of the features available through other call forwarding services, with the ability to use existing phone lines, and mobile devices to make and receive phone calls. However, they stand out against other services in that they do not offer unlimited calling on any of their pricing tiers. Which allows for a lower initial cost, which is great for users with a low call volume. However, due to restrictive policies in porting numbers to other services, poor customer service ratings, and outdated design of the product itself, we cannot recommend eVoice. For our highest recommended call forwarding service, please take a look at our TalkRoute review. Who is eVoice right for? 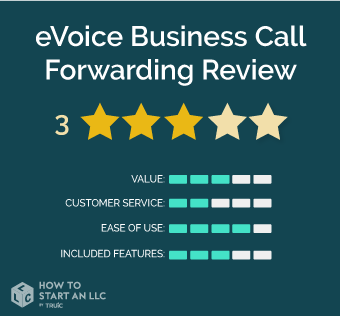 While eVoice is the lowest price option of all the call forwarding services we’ve reviewed, we here at How to Start an LLC cannot recommend this service. Please take a look at our reviews of TalkRoute and Grasshopper for services more appropriate for entrepreneurs and small teams. eVoice offers the most phone numbers available per plan, starting with 6 numbers on the lowest plan, and up to 45 numbers on the most expensive plan. A credit card must be entered to start a free trial, and from customer reviews available online, the cancellation policy of eVoice is not reliable. A phone number cannot be ported, or used on, a service outside of eVoice unless it had been ported into eVoice in the first place, and requires a $40 service fee to complete. 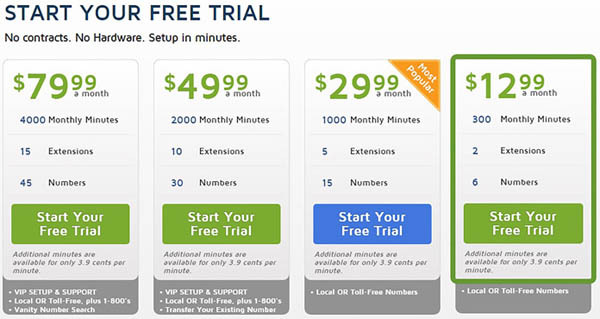 Unlike many competitors, eVoice does not have an unlimited minutes plan for calls to the U.S. and Canada. While this lowers the entry price, it can lead to a more variable monthly cost. Talkroute is a tool best suited for an entrepreneur or small team who may need extra help in getting set up in a new phone system and may grow over time to require additional support delivered through a service level agreement, or a similar, HIPPA-compliant BAA. While eVoice’s pricing structure is confusing in terms of the names of the plans available, and what features are available for each, they are some of the least expensive we’ve seen, and include a full set of features even in their plans meant for solo entrepreneurs. Features such as call auto-attendant, such as a menu system for your callers, extensions, calling hours, and voicemail management to email and text messages that some competitors charge a premium for. Features such as texting, call recording, web and video conferencing, etc. are available for an extra cost. Also, these plans do not include unlimited minutes like some of our other reviewed call forwarding alternatives such as Talkroute and Grasshopper. Who should purchase this Professional Plan? The Professional plan from eVoice is meant for solo entrepreneurs or freelancers looking to establish a professional phone number that they can still use from their own personal phone without the need for unlimited minutes, but with great tools like an auto-attendant. Who should purchase this Small Business Plan? The Small Business Plan is best for small teams looking for an alternative system to a traditional or VOIP phone system. The Small Business Plan includes all the features you would expect from a business phone system, such as device ringing rules, auto-attendant menus, transferring, voicemail, faxing and more. Who should purchase the Small Business Plan? The major difference between the first Small Business Plan and this is the number of minutes, extensions, numbers, and Setup and Support assistance from eVoice’s team. This plan is best for large teams who need eVoice’s largest number of prepaid minutes, extensions, numbers, and the support of eVoice’s team to get setup with the call forwarding system. eVoice is one of the few call forwarding systems that does not come with unlimited minutes. Whenever the plan’s allotted minutes are passed, there is a per-minute charge applied, and there are reports of unexpected charges. eVoices customer service is criticized across many reviews for not accepting cancellation requests, and having a bad attitude with customers asking for support. With a logically laid out support center, and a similarity to other phone systems, eVoice is easy to take on for someone with experience, or is technically minded. However, because their support team is not well rated, getting support for tasks may be difficult. While eVoice includes many of the features other call forwarding systems include, such as auto-attendants, call routing, scheduling, voicemail, and the most amount of phone numbers at the lowest rate, its lack of unlimited minutes are a setback among competitors that regularly offer this. In addition, you can only transfer existing phone numbers to eVoice starting at the $49.99 rate.